With Davis out, can an insider turn Baltimore police around? How, amid the continuing record-level crime and violence, would things be different under this 30-year veteran of the force, who has worked directly under the man he is replacing, outgoing commissioner Kevin Davis? Pugh cited “the diligence and attentiveness” that propelled De Sousa up through the ranks and “the skills” he acquired as a law enforcement fellow with the International Association of Chiefs of Police last year. But De Sousa’s remarks also made clear that the strategy is not new. It was employed twice in 2017 – under his predecessor, Commissioner Davis. “We did one in August of last year in two or three different districts, and the result was no homicides during this 12-day period,” he said. The “wave” approach was tried again in September along North Avenue and also met with success, he said. Pugh’s announcement that she is jettisoning Davis drew out-of-town media crews, but surprised few in Baltimore, where the 343 people killed last year has been the source of personal agony and civic shame. 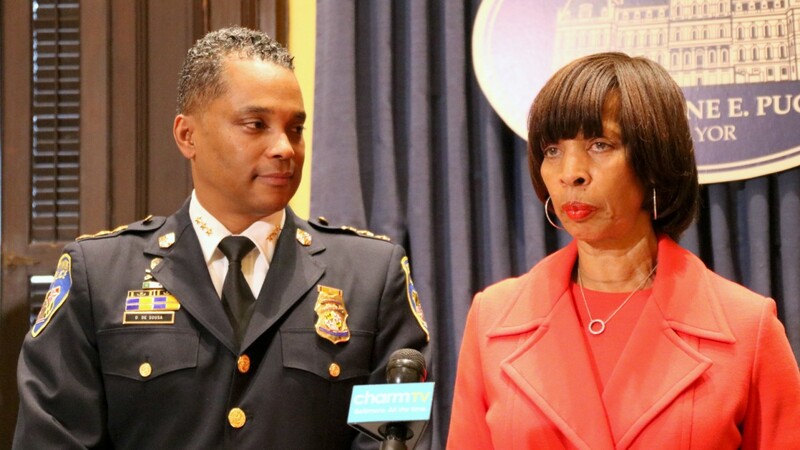 “You all know that 343 is one of the highest numbers in the country,” Pugh pointed out, speaking at City Hall with three city council members by her side (Robert Stokes, Sharon Middleton and Brandon Scott). “Crime is now spilling out all over the city, and we’ve got to focus. So I am charging this commissioner and his staff to get on top of it to reduce the numbers and to reduce them quickly,” she said. That was the very mission that former Mayor Stephanie Rawlings-Blake assigned to Davis when she named him interim commissioner in July 2015. Davis, who had previously worked in Prince George’s and Anne Arundel counties, replaced another outsider, Anthony Batts, whose last stint was as chief of police in Oakland, Calif.
Davis was confirmed as permanent commissioner – with a five-year contract and $200,000-a-year salary – in October 2015. Officials did not discuss today whether he would be eligible for a pension. De Sousa offered some other details about his plans leading the department, some of them eerily familiar. An example: “I have a strong message for the trigger-pullers – we’re coming after them,” De Sousa told reporters. According to Pugh, an outside expert will be coming next month to assist the department in crime reduction strategies. He is Sean Malinowsi, a deputy chief of operations at the Los Angeles Police Department. Asked where he would find enough officers to participate in these “waves,” DeSousa said it could be done by redeploying existing staff. De Sousa was asked not just how he would reduce crime but what tone he would set for a department that, as the Justice Department found in 2016, was deeply distrusted by the community. Would these waves of police officers represent in effect a return to the kind of corner-clearing, zero-tolerance policing that led to the pattern of bias and unconstitutional policing detailed in the DOJ report? As for the cloud of corruption hovering over the department with federal racketeering charges pending against six members of its Gun Trace Task Force (GTTF), little was said about it during the news conference. De Sousa was the commander of the Northeast district, the unit’s “stomping grounds,” as a reporter put it. De Sousa was asked how he plans to handle the matter of Detective Sean Suiter, who was found fatally shot the day before he was scheduled to testify in the case of one of those indicted officers. Councilman Brandon Scott, meanwhile, addressed the issue more directly. A previous supporter of De Sousa, Scott praised Pugh’s decision to name the longtime city resident and BPD veteran to the top cop job. “He’s someone who understands every aspect of the city, someone who raised children here, but will also have the respect of the rank-and-file officers,” Scott said. But can the public expect an insider, he was asked, to restore confidence in an agency currently mistrusted by many at its highest levels? “Yes, it depends on who that insider is, right? if the insider is part of what folks think is that clique that has been doing those things for so long, then definitely not,” Scott said. “But if it’s someone who folks know never agreed with that stuff and was in some cases punished for saying like ‘Look, this is not the things we should be doing,’ then yes, you can,” he said. “Someone who had the courage to do that should be commended,” Scott said. Darryl D. DeSousa (53), a native of New York City, moved to Baltimore in 1983 and entered Morgan State University. He deferred completion of his degree in order to join the Baltimore Police Department in 1988, but eventually received his degree in Applied Liberal Arts in 1997. Officer DeSousa was appointed Detective Sergeant in the Northeast District in 2001, and moved to the Cyber-Crimes Unit, Organized Crime Division in 2003. He was appointed Lieutenant Shift Commander in the Southeast District in 2007, and Deputy Major, Assistant Commanding Officer of the Northeast District in 2008. DeSousa became Major, Commanding Officer of the Northeast District in 2011 and in 2012 was appointed Lieutenant Colonel, Area Commander of the Neighborhood Patrol Division. He was appointed Colonel, Chief of Patrol, Neighborhood Patrol Division in 2013 and Deputy Police Commissioner, Administrative Bureau two years later. Notably, in 2016, Deputy DeSousa became a Visiting Fellow of the International Association of Chiefs of Police. In 2017, Deputy Commissioner DeSousa was assigned to lead the Patrol Bureau, the largest in the department, comprised of 3 divisions and more than 1000 sworn and civilian personnel. A resident of Baltimore City, Commissioner-Designate DeSousa is the father of 2 grown children.